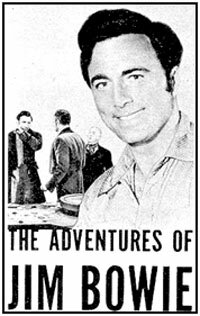 Do You Remember... "The Adventures of Jim Bowie"
He was a bold adventurin’ man. Battled for right with a powerful hand. 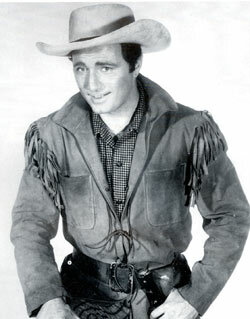 Replacing a six gun with a Bowie knife, Scott Forbes as Louisiana’s Jim Bowie sliced a wide swath on TV for 76 episodes (two seasons) from September 7, 1956, to May 28, 1958. 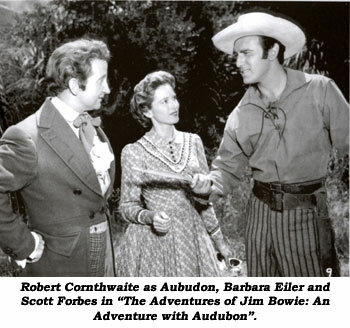 The half hour black and white “Adventures of Jim Bowie”, based loosely on the real life exploits of frontiersman James Bowie in the 1830s, aired Friday nights on ABC following “Rin Tin Tin”. The first episode, “Birth of the Blade”, relates the circumstances that led Bowie to invent his famous knife (although there are many true life variations of how the real blade came to be and who the actual maker was). The series, adapted from the book TEMPERED BLADE by Monte Barrett, allowed for backdrops of French-American New Orleans as well as backwoods settings as it followed Bowie, a wealthy young planter and adventurer, along a path that was crossed by many real life people including his good friend and naturalist John James Audubon (Robert Cornthwaite), famous pirate Jean Lafitte, President Andrew Jackson, Deaf Smith, Johnny Appleseed, Jefferson Davis, Sam Houston and the man with whom Bowie would share his fate at the Alamo, Davy Crockett. Jim’s brother Rezin Bowie (Peter Hansen, 1921– ), his mother (Minerva Urecal, 1894-1966) and newspaperman Justinian (Justy) Tebbs (William Schallert, 1922– ) were recurring characters. 6'2" Scott Forbes, whose favorite expression on the series was “Dog my cats!”, was born in Capetown, South Africa, where he spent his early years before moving with his mother and physician father (who was also a prominent portrait artist) first to Easton, PA, then New York, and finally London. When WWII broke out, Scott was in the RAF where he decided on an acting career after performing in camp shows. After the war, and some plays in England, he came to America where, in 1954, he met and married Jeanne Moody, a former Miss Alabama, then an actress. Forbes continued to act on into the ‘60s, he even had an interest in a fashionable Hollywood nightclub. Relocating back to England, he appeared on many BBC productions and toured with the National Theatre Company. Increasingly reclusive in later years as he began to write, he died February 25, 1997, in Swindon, Wiltshire, England.